Slightly less nutty this year…. So if any one ever looks at the alternative pages on here, you’ll see that last November I went a bit overboard on challenging myself to do stuff. This year I’ve been slightly less insane. 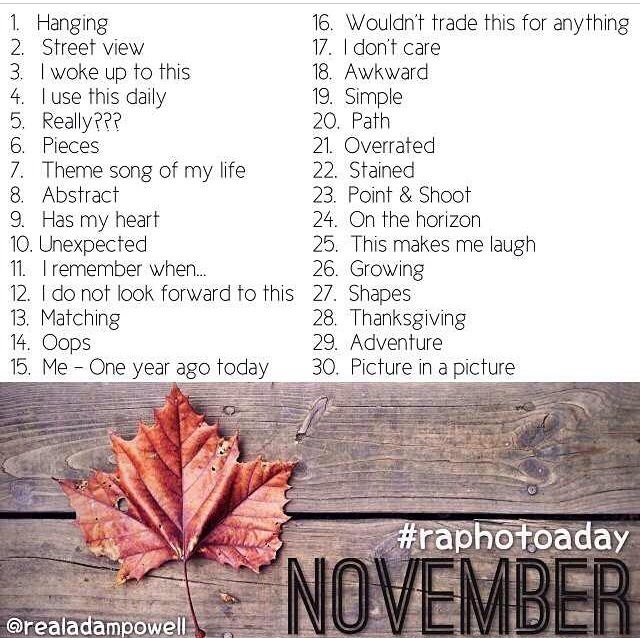 I’ve been attempting to keep up with photo challenges every month this year with varying degrees of success from complete months to forgotten months, but I’m still going, and will hopefully manage a full month this month to post here. I’m also signing on for NaBloPoMo again, as this place has been a tad neglected of late and with the upcoming winter months mean spending more tone indoors, writing will be a good way to spend that time, which means getting back into the swing of things. Talking of writing, I will be giving NaNoWriMo a miss this year. There’s a lot of upheaval at work at the moment and I’m just coming out of one of deepest down phases in a while so I think this would be just one step too many at the moment. Hopefully when Camp NaNoWriMo cones round in the new year I’ll be more focused and in the mood to give it a go. 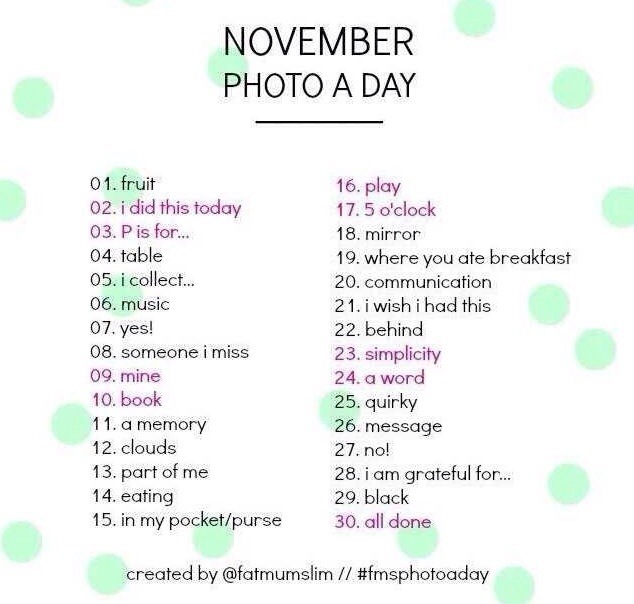 For now, these are the photo challenges I will be mixing and matching from for this month’s photo a day challenge. If you’re not following me on Instagram (search JoKawasaki) It’s usual for me to post all of my challenge photographs over on my blog The Day Watch, only for the purposes of my Nutty November challenges I will be duplicate posting them here. As for the NaBloPoMo posts? Well let’s see how that turns out shall we.